Preparation of the base: The surface must be completely free of dust and grease to ensure good adhesion of the corner profiles and the sealing tape. For best results, use a cleaner with alcohol or ethanol. 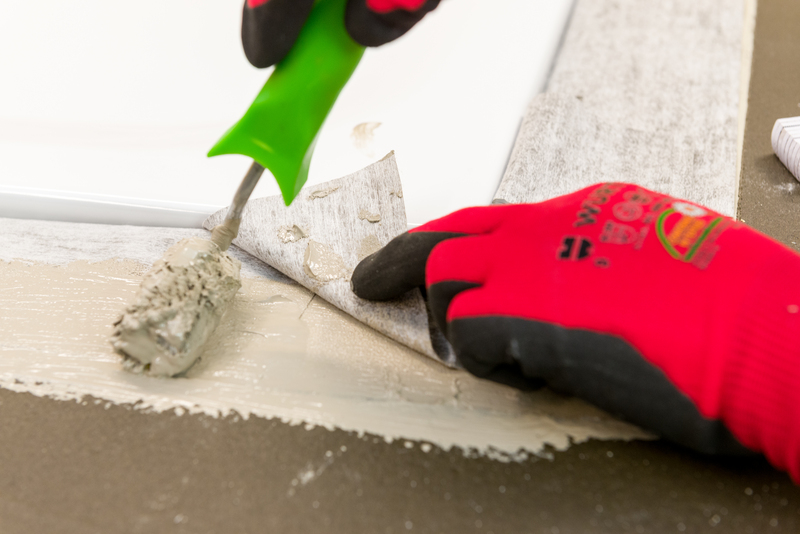 Remove the backing of the first corner profile, fit it to the outside of the shower surface – taking into account the tile thickness – and press in place. “I like to use a paint roller without sleeve to achieve a secure and permanent bond with the enamel surface. You can also use a clean, soft cloth instead. 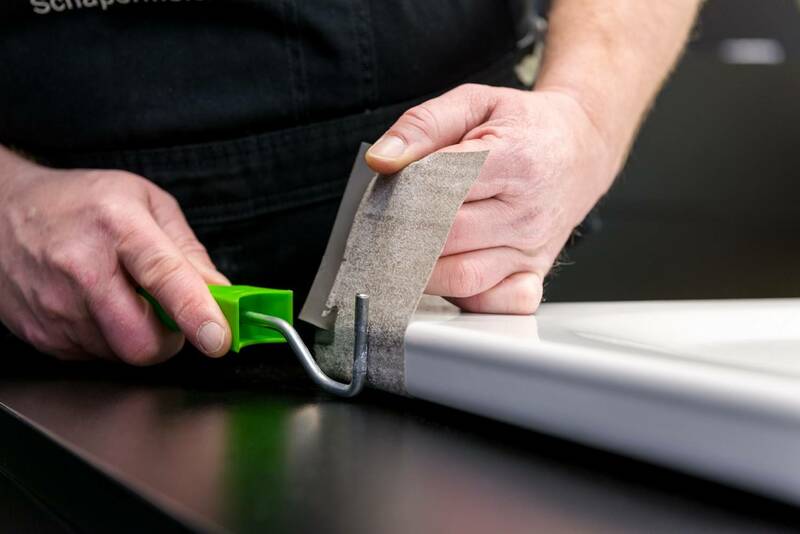 The heat produced by the rubbing action will actually improve the adhesion performance of the sealing strip,” advises Martin Schäpermeier. Do the same for all four corners. With the corner profiles affixed, cut the sealing tape to size. Importantly the sealing tape and corner profiles should always overlap by around five centimetres. 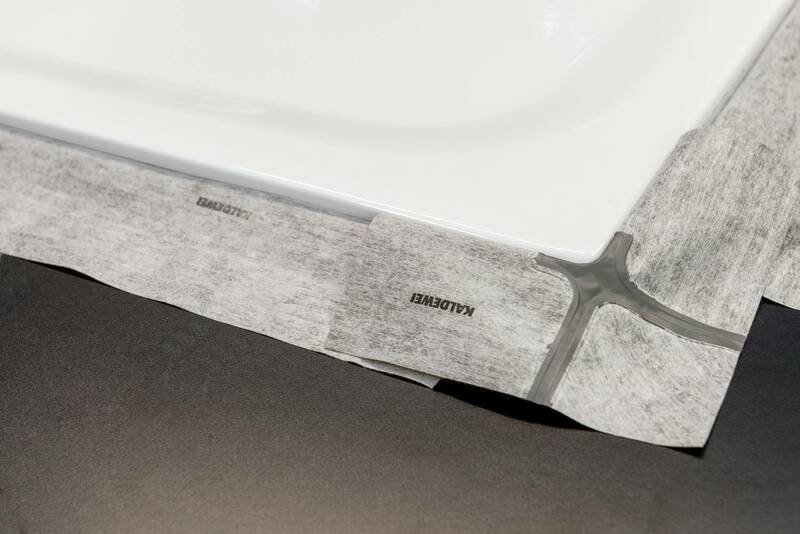 Finish sealing the shower tray on each side with the sealing strips, ensuring that they are properly attached. 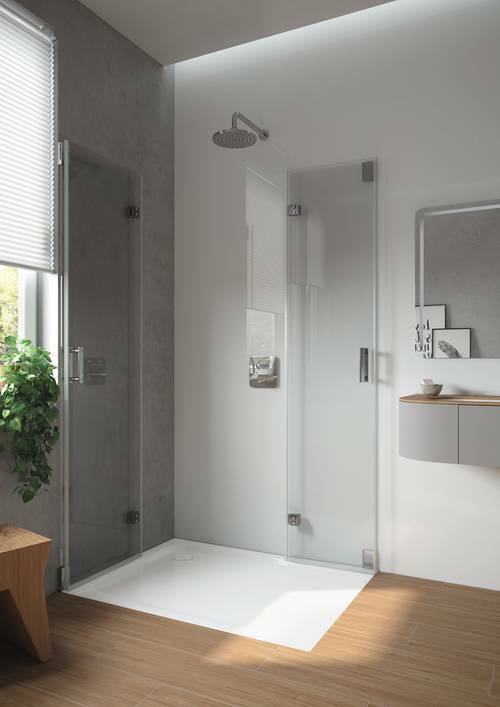 Next, position the installation frame and waste fitting and secure them in place, insert the shower surface into the frame and install the waste fitting. For composite sealing, apply a coat of sealant broadly across the screed and the walls, just below the sealing strips, before pressing on the corner profiles and sealing strips. The corner profiles and sealing strips are now bonded using sealant or sealing slurry. 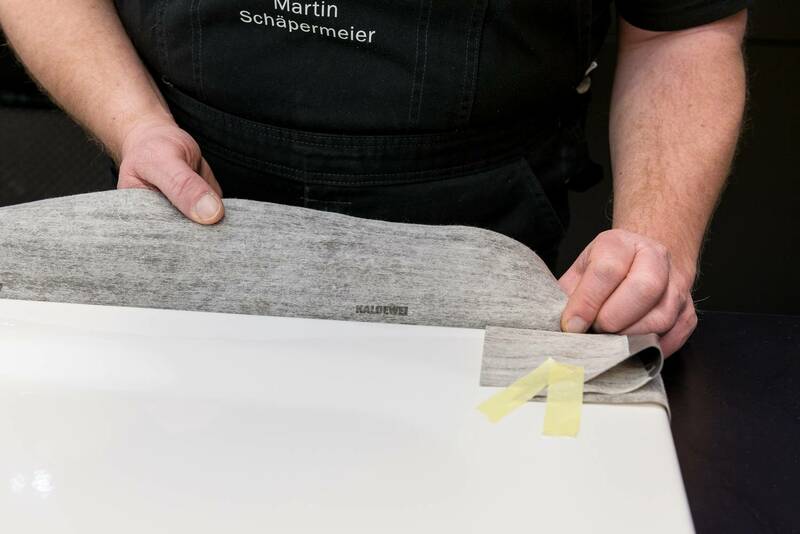 “Pay particular attention to the joints,” advises Martin Schäpermeier. When all sealing strips and corners are firmly bonded together, the Kaldewei sealing system is integrated into the bathroom’s composite sealing. This is done by simply applying the sealing right up to the edge of the enamelled shower surface, including over the strips. Shower surface, wall and floor are now absolutely impermeable. Once the tiler has finished the tiling, all that’s left to do is apply the maintenance joint around the enamelled shower surface – done. 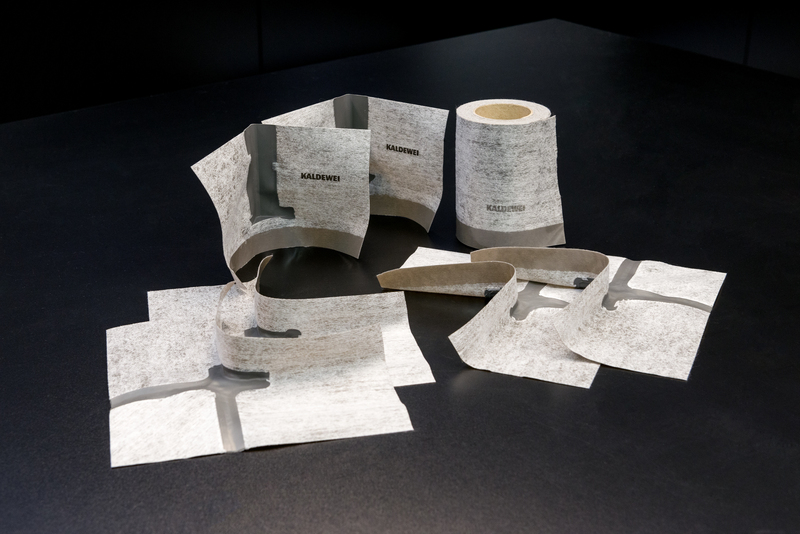 Detailed mounting and installation instructions are enclosed with all Kaldewei systems or can easily be viewed online. 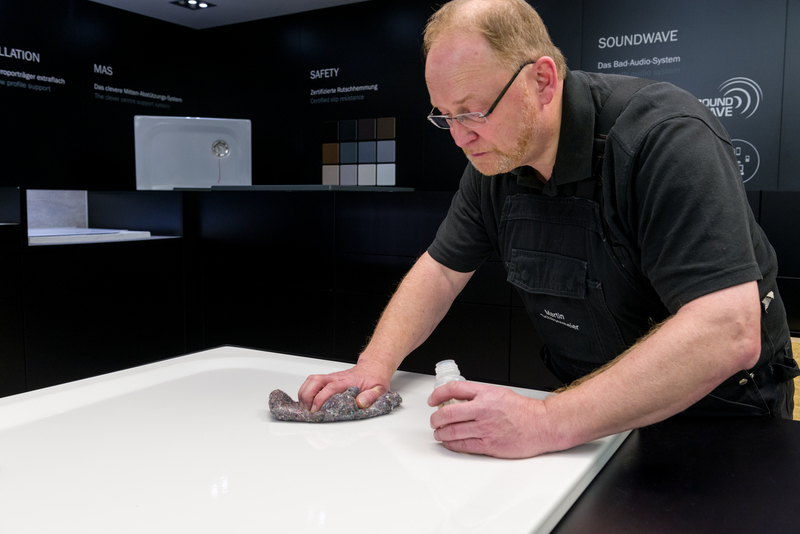 Additionally, bathroom professionals can download a variety of installation videos from the Kaldewei website, with easy-to-understand instructions for simple, fast and secure installation is just a few steps. An illustration of how to seal floor-level shower surfaces can also be found at the www.kaldewei.de/dichtset.